Must be Fusion Summoned. (Quick Effect): You can Tribute this card; destroy all monsters your opponent controls. If this card in your possession is sent to your GY by your opponent’s card: You can target 1 non-Fusion Monster in your GY; Special Summon it. You can only use this effect of “Prank-Kids Battle Butler” once per turn. We end this week off with the big Fusion of the Prank-Kids archetype, Prank-Kids Battle Butler. Battle Butler is a Level 10 WIND Thunder Fusion with 3000 ATK and DEF. Stats work for me on a Level 10, WIND is once again pretty meh, but Thunder means you can use Thunder Dragon Fusion to summon this. The summoning requirements are Prank-Kids Lampsies, Dropsies, and Fansies specifically, which neither of those three are hard to get to in this deck and once again having the in the GY can let you use Thunder Dragon Fusion, so summoning this isn’t as hard despite having three specific monsters as material. This will also be a mini review for the Link-4 Rip-Roarin-Roaster cause I couldn’t fit it into this week and the archetype has a ton of cards that do similar things, but with some variance, and that card covers space that this doesn’t. Battle Butler must be Fusion Summoned cause it is the bigger Fusion in the archetype and they don’t want you reviving it, the Link-4 works similarly. As a Quick Effect, you can tribute this card to destroy all monsters your opponent controls. Not bad to have a Raigeki on the opponent’s turn to really disrupt them, and I don’t mind that their big Fusion is basically Raigeki on legs considering this isn’t hard to summon. The Link-4 covers the land this doesn’t and destroys all Spells and Traps your opponent controls in case you need a Quick Effect Harpie’s Feather Duster on legs. If this card is sent to your GY while in your possession because of your opponent, which I can imagine your opponent will want to try to get rid of the Raigeki on legs, then this card can revive any non-Fusion monster in your GY, meaning you can get back one of the Link-2s of the archetype, one of their smaller Fusions, or a Prank-Kids main deck monster to use that as material and then get another Prank-Kids from your deck. Once again, the Link-4 is an opposite of this as it gets back any non-Link card to your hand. 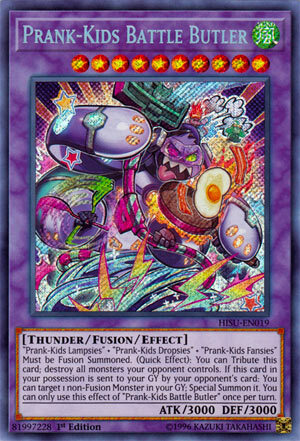 These big bosses for Prank-Kids are good for board clearing on your opponent’s turn and being massive threats, and they are good one ofs cause they still require the most resources out of any monster in the deck to summon and they can be recycled. Very nice to get a Raigeki and Harpie’s Feather Duster to use at any time without having to really draw Raigeki or Harpie’s Feather Duster (if the latter was legal in the TCG, but OCG has Feather Duster and not Raigeki). Art: 4/5 I get the Prank-Kids keep pranking you, but you don’t have to take it out on everyone else. Prank-Kids Battle Butler wraps up the week for these troublesome kids. Don’t you want to keep your boss monsters on the field? Prank-Kids Battle Butler is a Level 10 Wind Thunder-type Fusion Monster with 3000 Atk and 3000 Def. Good stats for a boss, not so good for Level 10, especially since this requires 3 specific different monsters to properly Fusion Summon and can only be Fusion Summoned. For the trouble, it tributes itself as a Quick Effect to destroy all your opponent’s monsters. It’s cool to nuke their board but you lose out on Battle Butler and it can’t be revived. Additionally, this can Special Summon any non-Fusion targeted monster from the grave when it hits the grave because of your opponent. It’s once per turn, but you are kinda stuck with one or the other effect and each one is somewhat lackluster. Raigeki for the first and reborn for the second are good effects, but this deck already does that with lower cost. Then the Atk isn’t really high enough for Level 10 and it looks kinda weird. Like Alfred the Butler, B-KBB might be nice to have, but Batman doesn’t need him. Happy Friday! Closing things off for Prank-Kids week is a gigantic Fusion Monster, Prank-Kids Battle Butler. Level 10, Wind and Thunder remain meh and good, respectively, and 3000 attack and defense is just magnificent. This card is Fusion Summoned specifically with Prank-Kids Lampsies, Dropsies, and Fansies. Normally, specific requirements aren’t a great thing to see, but given the speed of the Deck, as well as Thunder support, meaning Thunder Dragon Fusion can assist in this (as well as make the Fusion itself that much easier to perform for the player). So, Battle Butler (as a Quick Effect) can Tribute itself to destroy all Monsters your opponent controls. Obviously the 3000 attack is more than enough, but Raigeki is nice too. If sent to the Graveyard by your opponent’s card (note, not card effect, simply by their card) you can Special Summon a Prank-Kids Monster (not a Fusion, however, and we saw this earlier in the week with their Link Monster we covered) from your Graveyard. Said effect is, of course, once per turn. This is a great card, powerful, versatile, and keeps the cycling core of the Deck moving too. I still want to point out, as I did to open the week, just remember that going against a removal Deck will shut this down HARD, and with a small (for the time being card pool) that could be crippling. Art: 5/5 Great color, the kids are obviously lost here in this picture, and I see a fried egg there. Lots of pandemonium in this picture.